New prestigious one bedroom apartment at Newport Quays for 1 or 2 guests. Larger than the average apartment with a huge private balcony with outdoor dining furniture and water-views. The gourmet kitchen is fully equipped with stainless steel appliances, large fridge, microwave and dishwasher. Best Price Guarantee : Stay 2-13 nights for only $140 per night. Long term Stay : Stay 14+ nights $120 per night. Complimentary starter pack (tea, coffee, milk, mini soaps, shampoos, conditioners etc.) are included. Easy access to the city, entertainment centre & Adelaide Oval via public rail transport. You are staying within one of the most sought-after Adelaide apartments – so much to enjoy! If you book 10 nights or more you will receive a complimentary mid-stay service of clean linen & towels. Book with Executive Holiday Rental RIGHT NOW on line. More money in your pocket and peace of mind, knowing you will genuinely looked after. Lounge room - 55¨ plasma TV, Free Foxtel TV, DVD player and Hi-Fi. Bathroom with walk in shower, hand basin, toilet and hair dryer. PLEASE CLICK ON:- "Book Now" for availability !! Swimming pool, Sauna, Steam Room, Spa and Gymnasium. 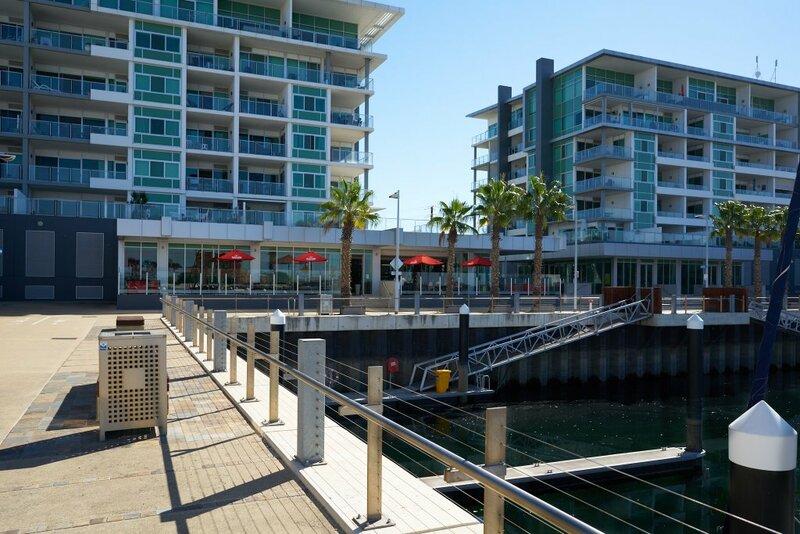 Discover a relaxed and peaceful waterfront living at Newport Quays- Port Adelaide, South Australia. Ethelton Railway Station located next to the apartment. Going into Adelaide only 20minutes by train – no parking problems. For weeknight games - the free travel period for normal Adelaide Metro scheduled services applies 3 hours prior to the game start time. For weekend games the free travel period is from first to last service. Going to the Adelaide Entertainment Centre. The Bowden Train Station is within an easy 350m walk of the Adelaide Entertainment Centre and provides easy pedestrian access to and from the Centre. Fully self contained with everything you need. It sets the standard for Luxury Adelaide Accommodation. Larger than the average apartment with a huge private balcony that features a BBQ, outdoor dining furniture. Water and surrounding views from the Balcony. The interior design reflects a superb combination of modern fittings and decor. Features and shared facilities:- Swimming pool, Sauna, Steam Room, Spa and Gymnasium. Secured apartment audio intercom System, Secure building with undercover car park for 1 car. Reverse cycle air conditioner, Large Private Balcony with water views, 55¨ Plasma TV, DVD recorder and Hi-Fi , free Foxtel Television, Bathroom with walk in shower, hand basin and toilet Hair dryer. Fully equipped gourmet kitchen with stainless steel appliances. Large fridge, microwave and dishwasher. Queen size bed watch TV in your bedroom - all linen supplied Laundry with washer and dryer. Non smoking- Smoking only allowed on the balcony. It is located less than 5 minutes from SA finest beaches 20 minutes from the CBD and the Airport Nearby is a host of leisure activities including Adelaide`s premier golf courses, sporting facilities and water sports such as rowing, canoeing or kayaking . The train is at your door stop to take you into the city, West Lakes, Semaphore and other areas of your choice. 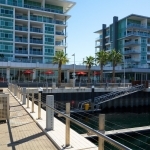 Enjoy walking along the waterfront promenade and landscaped gardens. Watch the sailing ships and dolphins. 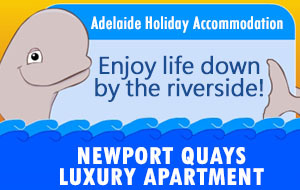 Take a sail or cruise on one of the ships at Port Adelaide for a dinner, dolphin spotting etc. Discover the new bars, restaurants and shops at the relaxing but never dull historical Port Adelaide. On the weekend the Port Adelaide really comes to life with popular craft/antiques, fresh fish and food markets etc. Nearby are the major shopping centres in Port Adelaide and Westfield Shopping Centre, cinema complexes. Very close to other beach side attraction such as Semaphore and North Haven that have a wide choice of wonderful restaurants to choose from.